PICTURES OF YESTERYEAR – PPL PHOTO AGENCY LTD – COPYRIGHT RESERVEDPHOTO CREDIT: PPLTEL: +44 (0)1243 555561 Email: ppl@mistral.co.uk www.pplmedia.com***Circa 1917 World war 1, Manfred von Richthofen (right) with his brother Lothar who served under him in JG 1, standing in front of a Fokker DR 1. Manfred Albrecht Freiherr von Richthofen (2 May 1892 ? 21 April 1918), also widely known as the Red Baron, was a German fighter pilot with the Imperial German Army Air Service (Luftstreitkräfte) during World War I. He is considered the top ace of that war, being officially credited with 80 air combat victories. Lothar-Siegfried Freiherr von Richthofen (27 September 1894 ? 4 July 1922) was a German First World War fighter ace credited with 40 victories. He was a younger brother of top-scoring ace Manfred von Richthofen (the Red Baron) and a distant cousin of Luftwaffe Field Marshal Wolfram von Richthofen. 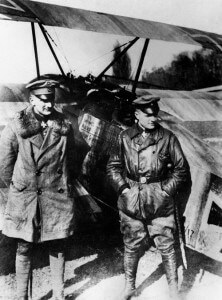 ***Circa 1917 World war 1, Manfred von Richthofen (right) with his brother Lothar who served under him in JG 1, standing in front of a Fokker DR 1. Manfred Albrecht Freiherr von Richthofen (2 May 1892 – 21 April 1918), also widely known as the Red Baron, was a German fighter pilot with the Imperial German Army Air Service (Luftstreitkräfte) during World War I. He is considered the top ace of that war, being officially credited with 80 air combat victories. Lothar-Siegfried Freiherr von Richthofen (27 September 1894 – 4 July 1922) was a German First World War fighter ace credited with 40 victories. He was a younger brother of top-scoring ace Manfred von Richthofen (the Red Baron) and a distant cousin of Luftwaffe Field Marshal Wolfram von Richthofen.